After sleeping on the floor of an Internet cafe in Narita Japan in order to get my 8am flight from NRT (NRT-KMQ on IBEX) I hit the McDonald's across the street for breakfast. 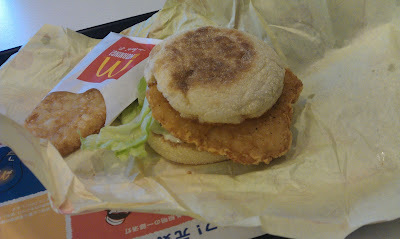 The limited time menu item this time was a 'Chicken Muffin'. A standard McMuffin bun, but with a piece of fried chicken instead of sausage or egg. I found they put a bit too much mayo for my taste (and far too much for being a breakfast sandwich), but the chicken was lightly breaded and had a big piece of white meat underneath. Also, Japanese set menu coffee was TINY. Unfortunately, I don't have a photo of it, but it probably only held 150mL. When the promotional period for this finished, McDonald's Malaysia has begun to sell the same thing, but at 1/2 the price.